In We’re No. 1, The A.V. Club examines an album that went to No. 1 on the Billboard charts to get to the heart of what it means to be popular in pop music, and how that concept has changed over the years. 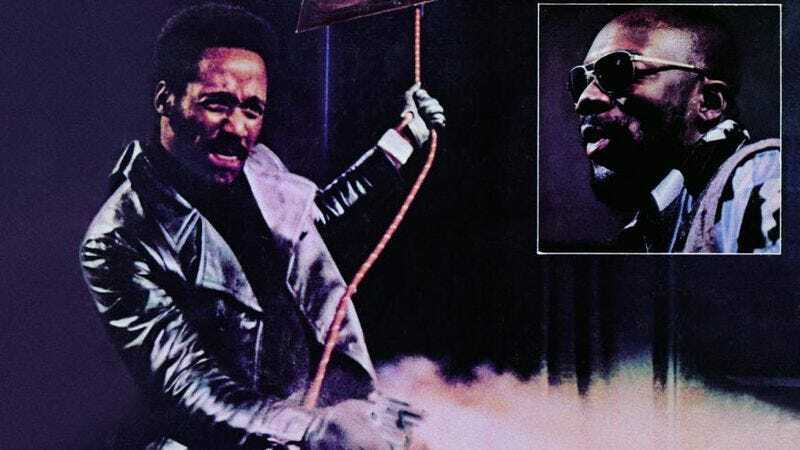 In this installment, we cover the soundtrack to Shaft by Isaac Hayes, which went to No. 1 on November 6, 1971, where it stayed for one week. When Isaac Hayes died suddenly at 65 on August 10, 2008, he left a massive discography that reached back nearly five decades and included more than 20 solo albums, dozens of collaborations and production credits—AllMusic lists 3,519 credits for him—and a legacy as one of the progenitors of the Memphis soul sound. Yet the many obituaries that followed only went an average of 17 words before mentioning Shaft. Hayes wrote and performed the entire soundtrack to Shaft, which stretched 15 mostly instrumental tracks across two LPs, but when people talk about the Shaft soundtrack, they’re usually talking about its opening salvo, “Theme From Shaft,” which made for one of the most unforgettable opening-credits sequences in film history. Were it not for Hayes’ soundtrack, it’s safe to say that Shaft would simply be remembered as an unremarkable entry in the short-lived blaxploitation genre. That goes for several of the genre’s films whose soundtracks provided some measure of immortality, such as Super Fly, Across 110th Street, Black Caesar, and The Mack, but only Hayes’ work earned an Oscar for Best Original Song (the first time a black person won the award), two Grammys, and a Golden Globe. The Shaft soundtrack would become the fastest-selling album in the history of Stax Records, the storied Memphis soul label that released it. Hayes had never scored a film when he was approached by director Gordon Parks, but he was hardly an unknown quantity: He had a long history as a musician, songwriter, and producer for Stax, and his 1969 solo album, Hot Buttered Soul, still qualifies as one of the boldest R&B/soul records of all time. But none of that necessarily meant Hayes knew how to score a film, so producers flew him to New York to see raw footage of three scenes to score as a sort of test. Still, Hayes banged out the rhythm tracks in less than a day (they’d allotted him two). The string and horn parts followed the next day, then vocals on the third day. Hayes, who always struggled writing lyrics, finished writing some of them in the limo on the way to the studio, according to Soulsville U.S.A. It took six weeks for Hayes and his band to complete the score. The most famous song on the Shaft soundtrack, “Theme From Shaft,” came last. Although Hayes had written a basic rhythm track for it in Memphis, he wanted to complete the rest of the score before finishing the song. “I wanted it to be a kind of abstract of the other melodies in the picture. I put them in there in such a way that they can’t be easily detected, but they’re in there, all right,” he told The New York Times. Hayes had come up through Stax Records writing pop songs for the likes of Sam And Dave—soul songs, yes, but pop music all the same—but left to his own devices, he never felt obligated to fit into pop’s constraints. He only hinted at it on his 1967 debut, Presenting Isaac Hayes, which mostly featured standards that Hayes mixed into long medleys. The opening track, “Precious, Precious,” was edited down from 19 minutes to 2:42 for the album. But when Hayes returned with his landmark album Hot Buttered Soul in 1969, he didn’t bother editing himself. The shortest song on the four-track full-length clocked in at 5:09, while the opening song, a cover of Burt Bacharach’s “Walk On By” lasted 12 minutes. The closer, a cover of Jimmy Webb’s “By The Time I Get To Phoenix,” lasted nearly 19 minutes and featured a long, spoken-word prelude from Hayes. His “raps,” as they were known, became a Hayes signature, particularly during live performances. Hollywood sure did. Shaft cost $1.2 million to make but earned back $10.8 million during its first year, which “confirmed the industry’s discovery of a hungry black audience that would wait in lines around the block to see black heroes victorious on screen,” writes Ed Guerrero in Framing Blackness: The African American Image In Film. Eleven months after Hayes’ soundtrack reached No. 1 on the Billboard albums chart, the soundtrack to another blaxploitation film, again written and performed by a black musician, took the top spot: Curtis Mayfield’s Super Fly. Where Shaft held the position for one week, Super Fly did it for four. Bobby Womack’s soundtrack for Across 110th Street also came out in 1972. Hayes would try a lot of new things the rest of his life, but “the Shaft thing” would remain a huge part of his legacy—so much so that people talking about him can only go 17 words without mentioning it. Next: The Go-Go’s stay atop the charts for six weeks with Beauty And The Beat.